In this paper I use a transborder lens to investigate the region encompassed by the Russian Far East, northeast China, eastern Mongolia, northern Korea, and the Sea of Japan. We need to transcend the framework of nation-states and restore the region’s historical agency in a broader geographic, geopolitical, and economic context. We also need to view the socioeconomic development of the area in terms of a protracted process in which variousindigenous groups played crucial roles. Recognizing the historical dynamic of this region helps to reconceptualize its present and future development. This paper focuses on the transborder region encompassed by the Russian Far East, northeast China, eastern Mongolia, northern Korea, and the Sea of Japan. I call it a “joint frontier” in that it is viewed as an outer and peripheral region in political, economic, and social terms by all surrounding nation states. To understand the historical dynamics of this frontier, I argue, we should view it not as an isolated and divided space at the margins of nation states but restore its historical agency in a broader geographic, geopolitical, and economic context. We also need to view the socioeconomic transformation of the area as a process encompassing at least 500 years, if not more, with multiple indigenous groups, state and nonstate actors alike, playing crucial roles in local development and interchanges. Realizing the historical dynamic of this region will help us reconsider its contemporary and future development and its place in the geopolitics of the wider region. The geographic area I am focusing on encompasses the Russian Far East (including Sakhalin Island), northeast China, eastern Mongolia, northern Korea, and the Japanese island of Hokkaidō. We have no common name to refer to this vast borderland in the northeastern part of the Eurasian Continent. The modern phrase “Far East,” which was popularly used before the 1960s, typically referred to Eastern Asia (including northeast Asia and sometimes southeast Asia). Today, “Far East” as a fixed geopolitical term is arguably only officially used in Russia (Dal’niy Vostok), referring to the eastern territory comprising the Far Eastern Federal District. 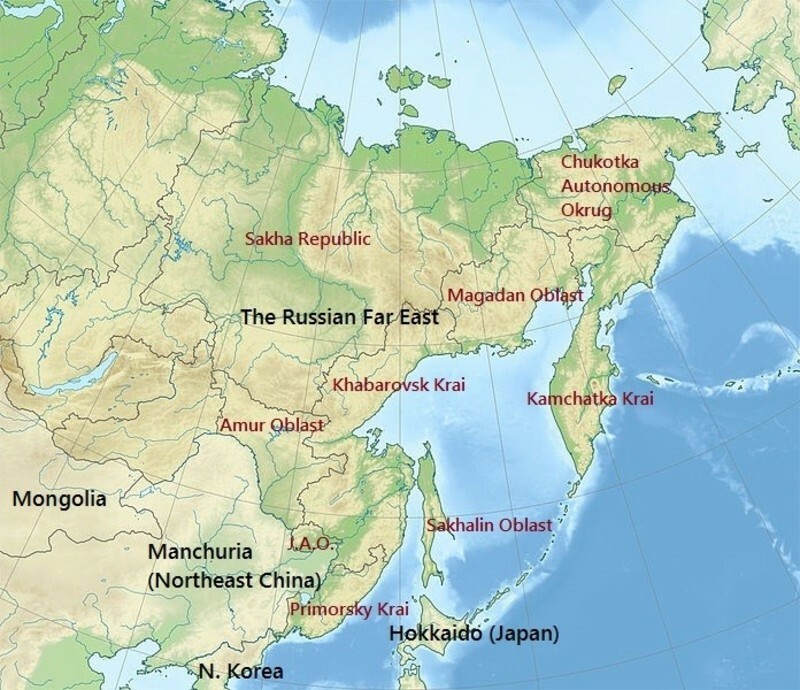 Since Russia is not normally considered an Asian nation, few scholars discuss the Russian Far East within the framework of Asia (and vice versa).3 By the same token, none of the indigenous terms used in Asian countries captures this vast land stretching from the Tumen River region all the way to the Chukchi Peninsula. Scholars refer to the Russian Far East as a “frozen frontier” or “the last frontier.” 4 The extremely harsh climate and mountainous topography, with its diverse ecological systems, make it one of the few areas in the Eurasian continent that has not been fully developed by modern states. The Russian Far East is of course not an isolated space. Its ecology and geography were shared with the larger geoecological realm surrounding it. 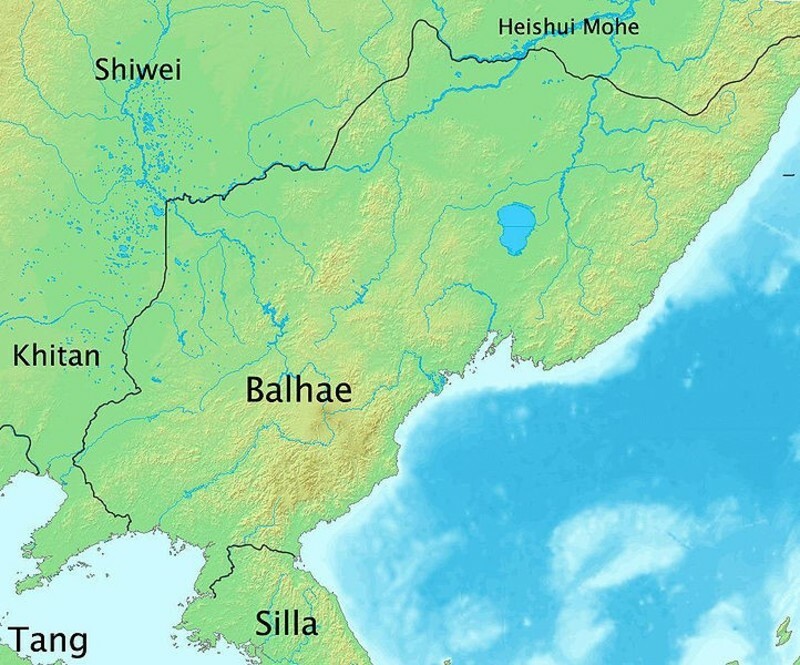 The southern part of this area (including the greater Amur River region5 and the Sea of Japan) deserves special attention, as it has long been a center of human activity, a place where multiple state influences intersect. Indigenous inhabitants long shared a similar nomadic or seminomadic lifestyle of hunting, fishing, and gathering. It was not until the nineteenth century that these modes of production gradually diversified with timbering, mining, agriculture and eventually industry brought by immigrant settlers. Local histories, not always in written form, largely concentrated on this relatively warmer part of the frontier. Likewise, if we look at today’s Russian Far East, leaving aside other parts of the region, it is clear that the local population is concentrated in its southern part. A significantly greater portion of economy in this federal district (90 percent of agricultural production, heavy industry, consumer goods production, and food processing) is in the five bordering administrative units of Amur Oblast, Jewish Autonomous Oblast, Khabarovsk Krai, Primorsky Krai, and Sakhalin Oblast. Vladivostok and Khabarovsk, the two largest cities in the Russian Far East (their populations far outnumbering that of the third largest city, Komsomolsk-on-Amur6), are both border cities and transportation hubs. Their strategic importance comes precisely from their location as gateways connecting the Russian Far East to the surrounding areas. The story of the Russian expedition, important as it is, has nevertheless been presented as a one-sided colonial narrative, much like its American counterpart of Manifest Destiny. While highlighting the continuity of Russian empire/nation-building, it ignores the internal momentum of regional development over a much more protracted historical period. It compresses history to a brief moment – a mere 65 years – relegating the long durée to the status of prologue to the consolidation of the Russian state. Another problem of the Russia-centered narrative is that it isolates the eastward movement from its global context. Such a movement is depicted as an “occasional” event due mainly to the initiative of certain “national heroes” (as Yermak is portrayed in modern Russian historiography). The impulse of capital accumulation and the desire to join a global competition for commercial interest are largely separated from the story of frontier exploitation. Recent developments in historiography, especially the application of world system theory and increasing attention to marginal communities, provide opportunities to rethink the history of this joint frontier.17 By examining indigenous dynamics of regional development, I place the transformation of Northeast Eurasia in a regional and global (as opposed to national) context. This is not to deny that competitive nation building over the last two centuries has been a decisive stimulus for borderland transitions. To the contrary, a frontier-centric view aims at reexamining the interaction between hinterland and frontier. It urges us to recognize the historical significance of the nation-state-building processes in all surrounding countries and gives us a new angle from which to consider the ongoing development of the region and its potential . Northeast Eurasia was the home of various ancient Altaic- or Turkish-speaking peoples. Many of them, such as the Sushen, Huimo, Donghu, Xianbei, Wuhuan, Fuyu, Woju, Mohe, Koguryŏ (Chinese: Gaogouli), Shiwei, Khitan, and Jurchen, gradually merged into (or amalgamated with) other groups and became indistinguishable from them. Many others, such as the Yakut, Nanai (Ch: Hezhe), Oroqen (Ch: Erlunchun), Daur, Koryaks, Evenks (Ch: Erwenke), Chukchi, Nivkh, and Ainu, are officially recognized minorities and indigenous peoples in today’s Russia, China, and Japan. It should be emphasized that the boundaries of these groups were far from rigid, and there was a large degree of overlap or acculturation both among them and with the surrounding communities such as the Han Chinese, Manchu, Russian, Mongol, Korean, and Japanese. A distinguishing feature of the indigenous groups is that most of them engaged in hunting, fishing, and gathering as their primary form of livelihood. Agriculture was also developed in the southern parts of the border region, especially in Manchuria and the northern Korean Peninsula. Archeological evidence shows the sociopolitical organizations of the indigenous people varied. Some formed states or quasi-states, others did not. Before the Mongol Empire (1206<-1368) conquered substantial parts of the Eurasian continent and for the first time placed a major part of Northeast Eurasia under a single administration (the Liaoyang Xingsheng), several indigenous kingdoms had ruled various parts of this frontier. Among them were Koguryŏ, Parhae, the Khitan Liao (915–1125), and the Jurchen Jin (1115–1234). 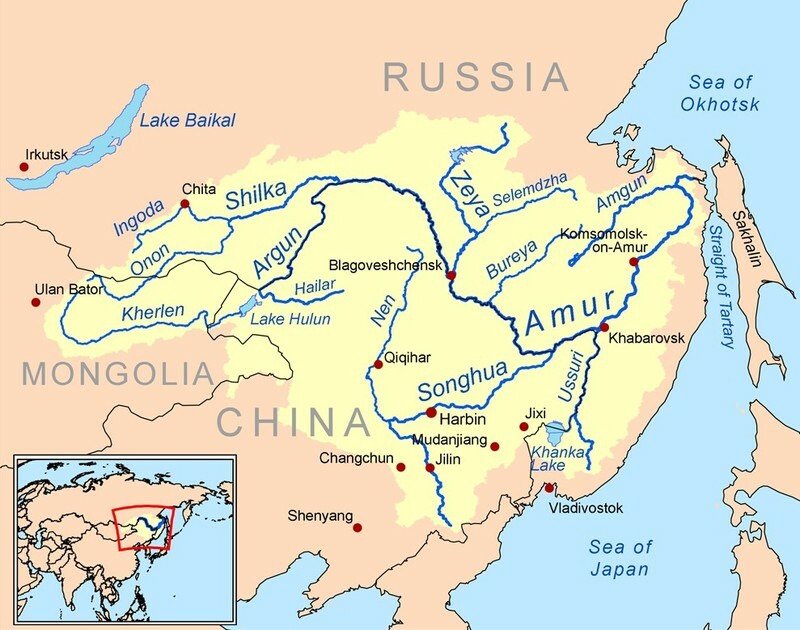 Although the centralizing governments viewed it as a marginal place, the diverse inhabitants of the greater Amur River region played a critical role in bringing East Asian societies together. Through war, trade, migration, and governmental communication, the region not only linked societies in China, Korea, and Japan but also connected East Asia to a larger world. Take the example of local religions: in all early indigenous regimes, from Koguryŏ to the Mongol Yuan, the belief system was a mixture of Buddhism and native Shamanism (occasionally combined with Daoism), which confirmed the region’s geocultural importance as a meeting ground of South Asia, Central Asia, and East Asia. It was also a hub on the trans-Eurasian trade route (aka the Silk Road): those traveling from Europe to Korea and Japan simply couldn’t bypass this region. 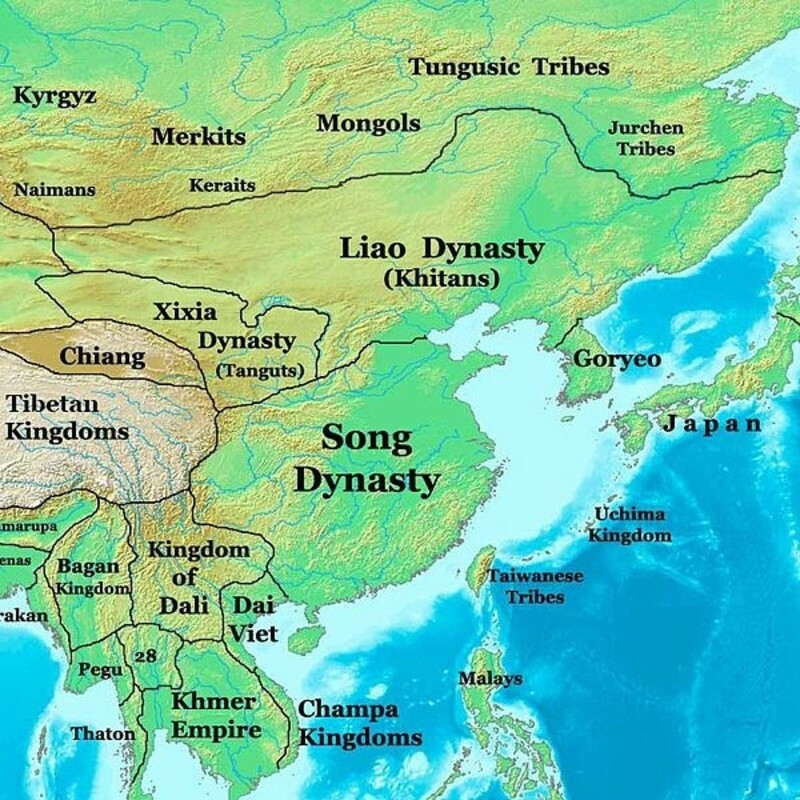 The earliest recorded Japanese contacts with China were through the four commanderies.20 Later the Koguryŏ kingdom frequently interacted with various Chinese dynasties to its west, Paekche and Silla to its south, the Wuji/Mohe tribes to its north, and Japan in the east. The Parhae kingdom established official diplomacy with both Tang China and Japan in the eighth and ninth centuries. The Khitan Liao and Jurchen Jin not only penetrated deeply into the Chinese hinterland but fostered trade relationships with states in central Asia, west Asia, and even eastern Europe. In most Slavic languages, the word “Khitan” (Kitay in Russian) is still the name for China, revealing the huge historical impact the Northeast Eurasian power once had in both ends of the continent. The regimes that arose in premodern Northeast Eurasia have distinct sociopolitical features (e.g. nomadic or semi-nomadic lifestyle and shamanism) that differentiate them to varying degrees from the Chinese, Korean, and Japanese states that existed in the same period. Today, however, their histories have been subsumed into the larger Chinese, Korean, Mongolian, and Japanese national Histories, provoking fierce debates as to which modern nation-state can lay claim to a particular indigenous regime. 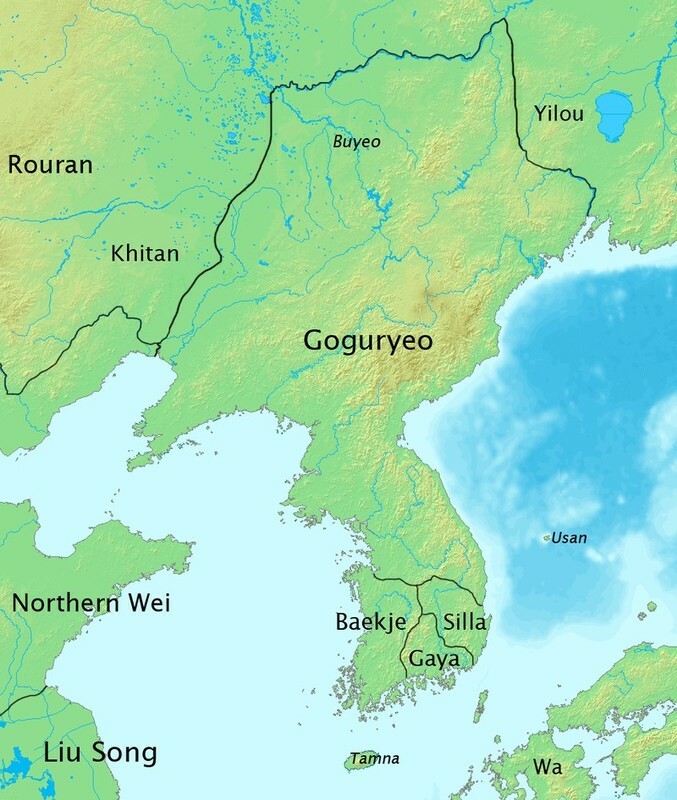 One of the most visible conflicts in recent decades has been the Chinese-Korean dispute over Koguryŏ/Gaogouli.21 Each side refused to view the ancient kingdom as an independent regional polity that adopted (and rejected) influences from both the Middle Kingdom and the southern part of the Korean Peninsula. Although the PRC and the ROK maintained a glowing bilateral trade record, the antagonism ignited by anachronistic historical narratives certainly hindered their political trust and cooperation. the Indian Ocean, central Asia, and northeast Asia. the first half of the 15th century. The Ming northeast expedition needs to be understood within global, regional, and local frameworks. First, the expedition was part of the imperial enterprise of extending China’s political influence, as was Zheng He’s voyage to the Indian Ocean. It incorporated Northeast Eurasia into what was to become a much more connected world. Commodity exchanges, in the form of tributary mission or border markets, strengthened Manchuria’s socioeconomic ties with China, Korea, and Siberia. Horses produced in Manchuria, furs in Siberia, and foodstuff and iron implements in China’s Central Plains and Korea were among the most important commodities. Various Jurchen chiefs competed for the limited patents to trade with the Ming. 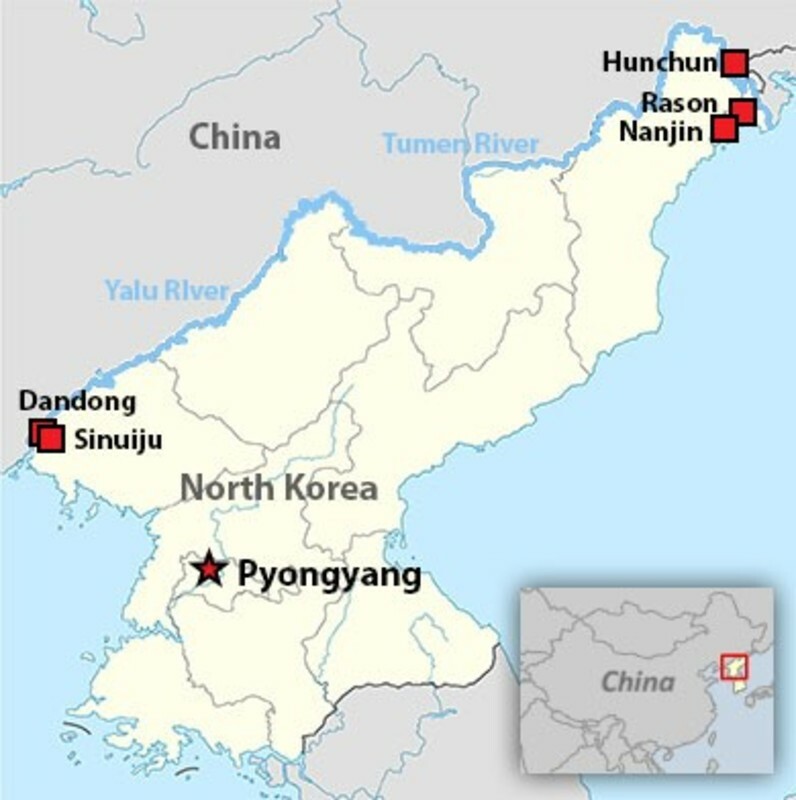 The monopoly of the Ming trade eventually contributed to Nurhaci’s unification of the Jurchen tribes in the late sixteenth and early seventeenth century.27Second, the expedition occurred around the time when Chosŏn Korea (1392-1897) expanded its territory to the Tumen River and Muromachi Japan (1336-1573) to southern Hokkaidō. All three East Asian powers were marching north to solidify control over the ethnic frontiers in the wake of the collapse of the Mongol Empire. Third, the establishment of Nurgan was initially proposed by native Jurchen tribes and was supervised by Yishiha, an ethnic Jurchen himself.28 These facts suggest that local initiative could be equally critical, if not more important, in linking the capital and the frontiers. The creation of the northeast Eurasian gateway was never a one-sided project imposed by the imperial state. The seventeenth century was a period of global imperial competition. It witnessed not only the rise of maritime powers like the Netherlands and Britain but also the rise of two continental powers in Eurasia: the Manchu Qing in the east and Russian Tsardom in the west.29 Russia was lured eastward to Siberia and the Far East, as mentioned above, by the huge profits in the fur trade. Historians suggest that before the fiscal reform of Peter the Great (r. 1696-1725), profits from the fur trade accounted for approximately 10% of the state revenue.30 The same quest for fur drove the Dutch, the British, and the French to explore and conquer North America. The two new sources for fur, Siberia and North America, spurred the contests for markets and trade routes. But fur was not itself the end goal. European explorers expected the capital generated by the fur trade to fund a bigger enterprise: trade with China. As Timothy Brook explains, “The dream of getting to China is the imaginative thread that runs through the history of early-modern Europe’s struggle to escape from its isolation and enter the wider world.”31 From this perspective, Russia’s eastward push, perhaps the only expedition to kill two birds with one stone, was an inseparable part of early global reach of the European powers. Qing policy towards the Amur River region differed from Russian policy towards the same region. 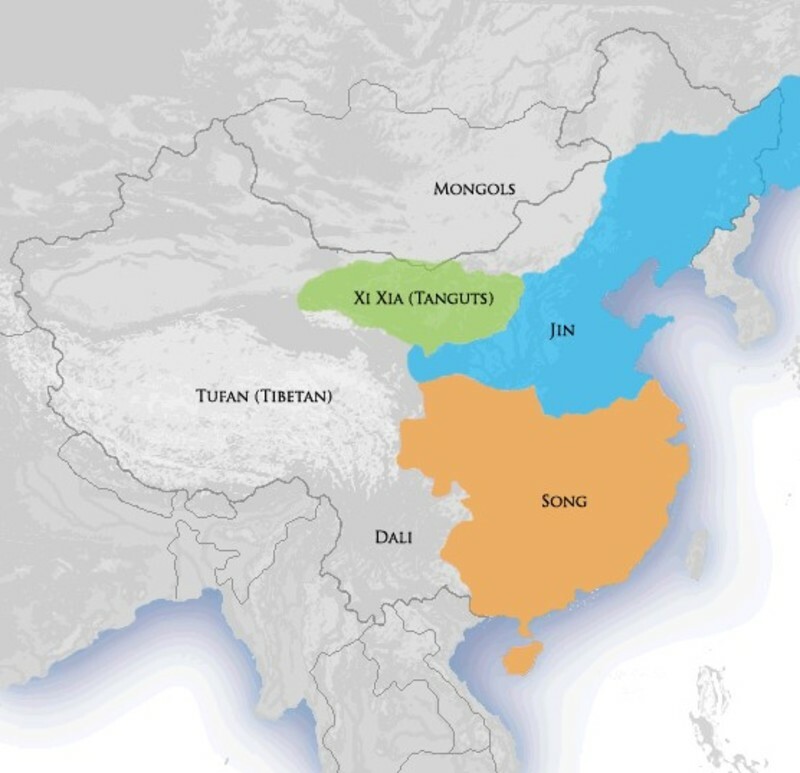 During most of the Qing period, the forest zone of Jilin and Heilongjiang, largely segregated from the agricultural zone of Liaodong and the nomadic zone of Mongolia, was designated as “royal reserves” for the Manchus. Access to this part of the empire was limited. As a result, in the seventeenth and eighteenth century when Russia gradually extended its reach to the far north, even Alaska, the Qing Northeast Eurasia was preserved from exploitation (and continued to be so until the late nineteenth century). The military clash between the two great powers eventually led to a Qing-Russian agreement to divide Northeast Eurasia. The 1689 Treaty of Nerchinsk officially established the boundaries and regulated bilateral trade.34 The treaty, mediated by Jesuit and Mongol interpreters, was among the earliest of several similar diplomatic protocols between countries of the Eurasian continent. In other words, the competition over this frontier gave birth to one of the first international treaties over national territory in the modern world.35 As a result, Russia was kept out of the Amur River basin until 1860. In 1727, Russia and Qing China signed the Treaty of Kyakhta, which established official border trade between the two empires. The treaty made Kyakhta one of the most famous Sino-European commercial ports (along with Canton) and helped to create a thriving cross-continental trade route through the Mongolian steppe. There is no need to elaborate on the competition among Russia (and later the Soviet Union), Japan, China, Korea, and the United States to control the region in the last two centuries. But we need to understand how certain significant transitions in this multilateral borderland were partly the result of this competition. Russia’s territorial acquisitions, especially outer Manchuria in 1860 and Sakhalin in 1875, stimulated great immigration waves from all directions. To strengthen their control on Manchuria, the Qing gradually opened what were once forbidden lands and encouraged Chinese to settle the region. It also allowed Koreans to claim the wild land north to the Tumen and Yalu Rivers. By the end of World War II, northeast China was home to 20 million Han Chinese, nearly 2 million Koreans and 1.66 million Japanese. Responding to the Russian threat, Meiji Japan also moved aggressively to colonize Hokkaidō and the Kuril Islands. By 1945, more than 3.5 million Japanese and others had migrated to Hokkaidō. Between 1860 and 1940, the Russian Far East not only accommodated millions of immigrants from Ukraine, Siberia, and central Russia but also 200,000 Koreans (who were forcibly resettled in central Asia in the 1930s). The immigrants far outnumbered the indigenous peoples, who were classified as ethnic minorities in their homeland with the flow of migrants from the late nineteenth century. Second, with the arrival of agricultural settlers and large-scale building of infrastructure (roads, railways, ports and cities), what had been a forest frontier simultaneously experienced agricultural and industrial development. Manchuria and Hokkaidō became important food bases for China and Japan. The fishing industry in Primorsky and Hokkaidō played a critical role in Russia and Japan. Mining and timber industries had long been economic pillars of the region. Heavy industries in northeast China in the twentieth century were among the most advanced in East Asia. The result was the modern transformation of local ways of life and the profound transformation of society and ecology. Third, the modern transformation of the frontier took place amidst fierce rivalry among the powers. The industrialization of northeast China can be trace to late Qing New Policy reforms and their extension under the Beiyang warlords in the 1910s and 20s. The Japanese turned Manchukuo into an industrial base of the colonial empire in the years 1932-45.38 With significant input from the Soviets, northeast China became a vital engine for industrialization of the PRC from the late 1940s. The industrial transformation of Northeast Eurasia thus continued across various historical stages, taking place under diverse political regimes including imperialism, colonialism, nationalism, and socialism). We cannot understand the transition of the region without seeing its historical continuities. Finally, the frontier’s transition since the nineteenth century would not have been possible had there had been no local initiative or transboundary collaboration. Take the example of the Trans-Siberian Railway (1891-1916) (including the Chinese Eastern Railway and South Manchurian Railway attached to it), a grand project that significantly changed Northeast Eurasia’s political, economic, and ecological landscapes. The construction of the railway combined the efforts of engineers, laborers, managers, local suppliers, and technicians from Russia, China, Korea, and Japan. It was hardly an enterprise completed by one government or one group of people. By the same token, northeast China and Primorsky became rice producers only because Korean immigrants, through years of experiment in the early twentieth century, applied Japanese seed and their farming skill to the paddy fields in this high-latitude area.41 Later Chinese, Russians, and Japanese all promoted rice farming in this area, to the extent that the principal local food changed from millet to rice. This history of local cooperation is, I believe, particularly pertinent for discussion today. In this multinational frontier, no single nation could build a thriving economy or society on its own. Recognizing the difficulties, the Chinese government altered the original plan and refocused on developing the provincial economy of Jilin, hoping that its power would radiate to the frontier. In 2009 the Jilin provincial government presented the “Outline of the Tumen River Area Cooperative Development Program Considering Changchun-Jilin-Tumen as a Pilot Zone for Development and Opening.”52 The program soon received the Chinese central government’s endorsement.53 The new plan prioritized the economic integration of the three sub-regions in Jilin: Changchun, Jilin, and the Yanbian Korean Autonomous Prefecture. Hunchun’s strategic status was again highlighted. Viewing industrialized regions like Changchun and Jilin as its hinterland, the Chinese promised to turn Hunchun into the “bridgehead of Tumen River regional cooperation.” Some progress has been made since 2009, especially in infrastructure. The collaboration with North Korea, including the long-term lease of the Rasŏn port and transborder tourism, also shows some positive signs. Yet the program faces challenges in the form of international and domestic politics, long-term investment, and a sustainable social environment. Considering especially the current awkward China-DPRK relationship since North Korean leader Kim Jungun assumed power in 2011, the future of bilateral economic cooperation remains in doubt. Viewed in regional perspective, neither the Tumen Initiative nor the Changchun-Jilin-Tumen program is a new creation. Rather, each can be seen as a return to the past or the resumption of an historical trajectory that was interrupted by geopolitical conflict in the last century. The historical evolution of Hunchun —and the northeast frontier in general—was never just about economy or trade. Although Hunchun once played a leading role in regional trade, the prosperity of such a network was contingent on the social-ecological transition of Northeast Eurasia in general. The key to its historical success was not so much the logic of a transborder free market but the transformation of the frontier region within a dynamic state and region. Without a comprehensive program for promoting social and ecological development in Hunchun and throughout the region, the economy will eventually lose momentum. In the past two decades, transportation and communications infrastructure in Hunchun has grown dramatically. However, a significant portion of young ethnic Koreans have left for employment as migrant workers in South Korea. The “empty-nest” family has become a pervasive social problem in both the countryside and cities in Yanbian. If current economic plans and programs cannot attract local youth, how will they attract people from elsewhere? 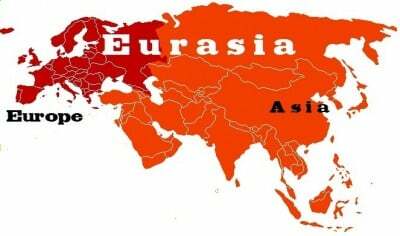 Russia’s recent “pivot to Asia” has drawn interest in the economic potential of the Northeast Eurasian frontier. But Russia’s move is only the latest in various similar projects initiated by various states in the region. For example, Japan was arguably the first country to promote the concept of “the economic circle surrounding the Sea of Japan.” Immediately after the end of the Cold War, this project envisioned international collaboration among Japan, Russia, China, and the two Koreas. Japan’s plan was followed by the Greater Tumen Initiative, which was announced by the UNDP and endorsed by China, Russia, Mongolia, South Korea, and North Korea (which withdrew in 2009). 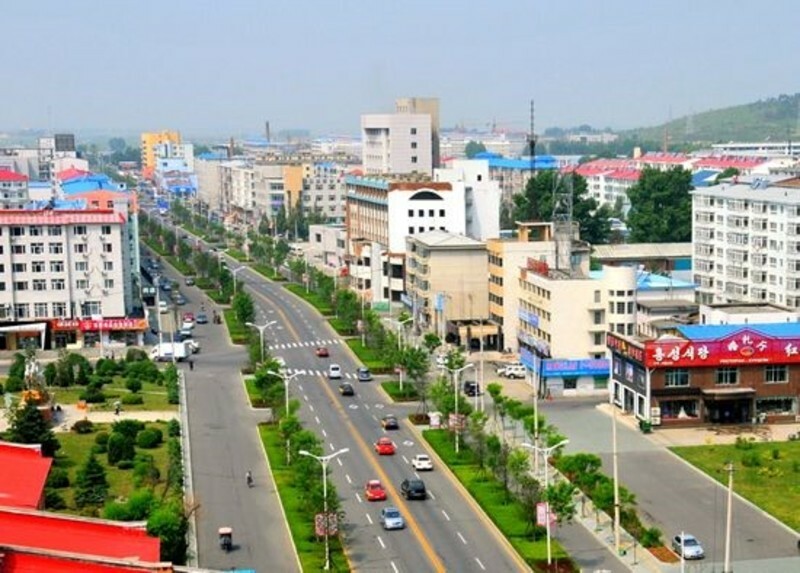 Moreover, in the 1990s, North Korea established its first “economic special zone” in Rasŏn, a city that adjoins both Russia and China. In 2010, P’yŏngyang even promoted Rasŏn as a “special city” governed directly by P’yŏngyang. Russia’s recent “pivot” further confirms the strategic importance of this Eurasian gateway. However, none of the previous projects achieved their goal. If this plan is to be more successful, it is important to learn the lessons suggested by earlier projects. The most important one, simply put, is that the national agendas of each country hardly coincide. Inter-national conflicts during the last century have repeatedly undermined attempts to fulfill the regional potential for development and trade. Ultimately, multilateral cooperation is critical to the success of all of these projects. By providing an alternative way to view the history and modern development of the northeast Eurasian frontier, I argue for understanding this ecological space in terms of its unique historical agency, with its own developmental dynamic. It was never isolated from “civilizations,” nor was it merely a joint periphery of multiple nation-states. Rather, this region not only played a crucial role in connecting various Asian societies while also giving birth to some great transregional powers, notably the Yuan and the Qing. The history of this frontier is inseparable from regional and global history with their cycles of absorption and expansion. This multilateral interaction repeatedly transformed the region, at times making it a dynamic immigrant destinations and developmental area, while remaining susceptible to conflicts among the regional powers. Current attempts to revitalize the economy of this joint frontier must be seen within the historical trajectory of local and regional evolution and transformation; success hinges ultimately on the development of local and regional social and ecological systems. Comparing the trading systems in Southeast Asia, where the overseas Chinese played a critical role in forming a social network, Takeshi Hamashita observes that a major difficulty for the future development of Northeast Asia is “the lack of an appropriate human network that could serve as a template for regional structures.”54 International cooperation is possible only if there is sufficient local initiative. A unilaterally imposed plan cannot succeed if it serves only the short-term interests of a state rather than the long-term welfare of a transborder society. By the same token, a neoliberal vision of a “free-trade zone,” which highlights only economic development but not social and ecological development, is hardly sustainable. Nianshen Song ([email protected]) is a Mellon Postdoctoral Fellow in the History Department, Vassar College. This article is based on a paper he presented at the conference “Developing Asia Pacific’s Last Frontier: Fostering International Cooperation in the Development of Russia’s Siberia and Far East,” held in Vladivostok, Russia, in 2015. 1 Andrew C. Kuchins, “Russia and the CIS in 2013: Russia’s Pivot to Asia,” Asian Survey, Vol. 54, No. 1, A Survey of Asia in 2013 (January/February 2014), pp. 129-137. 2 The first recognition of the importance of the region in Anglophone literature came in the 1990s after the collapse of the Soviet Union. See, for example, Stephen Kotkin and David Wolff, eds., Rediscovering Russia in Asia: Siberia and the Russian Far East (New York: Routledge, 1995); Mark J. Valencia, ed., The Russian Far East in Transition: Opportunities for Regional Economic Cooperation (Boulder: Westview Press, 1995); Tsuneo Akaha, ed., Politics and Economics in the Russian Far East: Changing Ties with Asia-Pacific (London: Routledge, 1997); Peggy Falkenheim Meyer, “The Russian Far East’s Economic Integration with Northeast Asia: Problems and Prospects,” Pacific Affairs, Vol. 72, No. 2 (Summer 1999), pp. 209-224. Also mention literature on Tumen zone from 1992? 3 For example, the Association for Asian Studies, the world’s leading academic organization in Asian studies, doesn’t list Russia or the Russian Far East within its research umbrella. 4 For example, see Alan Woods, Russia’s Frozen Frontier: A History of Siberia and the Russian Far East 1581-1991, (New York: Bloomsbury Academy, 2011) and Sue Davis, The Russian Far East: The Last Frontier? (New York: Routledge, 2003). 5 I use this term to refer to an area that roughly includes the eastern part of northeast China (Jilin and Heilongjiang Provinces, and the eastern part of Inner Mongolia), the southern part of the Russian Far East (Amur Oblast, the Jewish Autonomous Oblast, Primorsky Krai, and southern Khabarovsk Krai), the eastern part of Mongolia, and the northeastern part of the Korean Peninsula. 6 According to the 2002 census, the populations of Vladivostok and Khabarovsk are 594,701 and 583,072 respectively. The population of Komsomolsk-on-Amur, the third largest city in RFE, was 271,600. Source: Russian Census of 2002. 7 Owen Lattimore, Inner Asian Frontier of China (Boston: Beacon Press, 1967). See also Joseph Fletcher, “Ch’ing Inner Asia,” in Denis Crispin Twitchett and John King Fairbank, eds., The Cambridge History of China, Volume 10, Part 1 (London: Cambridge University Press, 1978), pp. 35–106. However, in a new book Evelyn Rawski argues that “[f]rom the perspective of the sixteenth and seventeenth centuries … the primary Inner Asian influences come from northeast Asia.” Evelyn Rawski, Early Modern China and Northeast Asia: Cross-Border Perspectives, (Cambridge: Cambridge University Press, 2015) p.2. 9 James Scott, The Art of Not Being Governed: An Anarchist History of Upland Southeast Asia (New Haven, CT: Yale University Press, 2009). 10 During the heyday of Russia’s eastward expansion, Russian intellectuals frequently envisaged the Amur River region as “Russia’s very own Mississippi.” See Mark Bassin, Imperial Visions: Nationalist Imagination and Geographical Expansion in the Russian Far East, 1840-1865, (Cambridge: Cambridge University Press, 1999), p.10. 11 Alan Wood, Russia’s Frozen Frontier: A History of Siberia and the Russian Far East, 1581 – 1991 (New York: Bloomsbury Academic, 2011), p. 31. 12 Michele Manson, Dominant Narratives of Colonial Hokkaido and Imperial Japan: Envisioning the Periphery and the Modern Nation-State (New York: Palgrave Macmillan, 2012). 13 Jin Yufu, Dongbei tongshi (东北通史) (Chongqing: Wushi Niandai Press, 1943); Xue Hong and Li Shutian, eds., Zhongguo dongbei tongshi (中国东北通史)(Changchun: Jilin Wenshi Press, 1991). 14 Andre Schmid, “Looking North toward Manchuria,” South Atlantic Quarterly, Vol. 99, No. 1 (Winter 2000), pp. 219–240; Andre Schmid,”Rediscovering Manchuria: Sin Ch’aeho and the Politics of Territorial History in Korea,” Journal of Asian Studies, Vol. 56, No. 1 (February 1997), pp. 26-46. 15 John J. Stephan, The Russian Far East: A History (Stanford, CA: Stanford University Press, 1994), p. 2. 16 Owen Lattimore, Manchuria: Cradle of Conflict (New York: Macmillan, 1935). 18 Stephan, The Russian Far East, pp. 14-19. 19 Nihon shoki (日本書紀), Vol. 26. 21 Yonson Ahn, “The Contested Heritage of Koguryo/Gaogouli and China-Korea Conflict,” Asia-Pacific Journal: Japan Focus (accessed on May 6, 2015). 22 See Timothy Brook, Vermeer’s Hat: The Seventeenth Century and the Dawn of the Global World (New York: Bloomsbury Press, 2008). 23 See Geoff Wade, “The Zheng He Voyages: A Reassessment,” Journal of the Malaysian Branch of the Royal Asiatic Society, Vol. 78, No. 1 (288) (2005), pp. 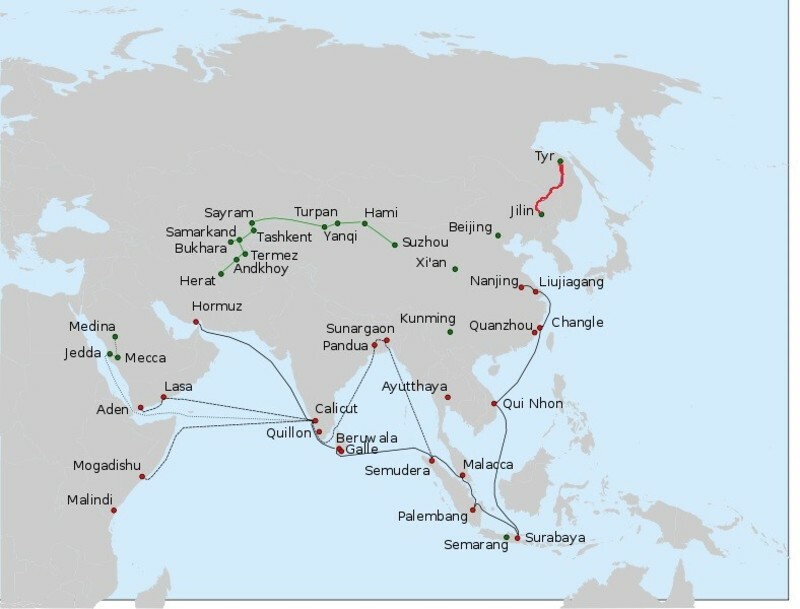 37-58; Tansen Sen, “The Formation of Chinese Maritime Networks to Southern Asia, 1200-1450,” Journal of the Economic and Social History of the Orient, Vol. 49, No. 4 (2006), pp. 421-453. 24 Li Jiancai, Ming dai dong bei (明代东北) (Shenyang: Liaoning Renmin Press, 1986), pp. 17-19. The size of his expedition varied each time. For example, in 1411, he employed 25 giant boats with more than 1000 staff and crew; the final expedition (1432) mobilized 50 giant boats with a crew exceeding 2000 . 26 Li Jiancai, Ming dai dongbei, p. 19. Also see Agui, qing ding man zhou yuan liu kao (欽定滿洲源流考), Vol.1. 28 Shih-Shan Henry Tsai, The Eunuchs in the Ming Dynasty (New York: SUNY Press, 1996), pp. 129–130. 29 See Peter Perdue, China Marches West: The Qing Conquest of Central Eurasia (Cambridge: Harvard University Press, 2005). 30 Wood, Russia’s Frozen Frontier, p. 32. 31 Brook, Vermeer’s Hat, pp. 43-46. 32 See Pamela Kyle Crossley, A Translucent Mirror: History and Identity in Qing Imperial Ideology (Berkeley : University of California Press, 1999); Mark Elliot,The Manchu Way: The Eight Banners and Ethnic Identity in Late Imperial China (Stanford, CA: Stanford University Press, 2001); Peter Perdue, China Marches West: The Qing Conquest of Central Eurasia (Cambridge: Harvard University Press, 2005). 33 The only exception was Fumingga, a member of the Hanjun banner who was the commander of Jilin from 1866 to 1870. Eighteenth-Century Studies, Vol. 43, No. 3 (Spring 2010), pp.341-356. 35 Wang Hui, Xiandai zhongguo sixiang de xingqi (现代中国思想的兴起) (Beijing: SDX Joint Press, 2004), p. 690. 36 Donald Keene, The Japanese Discovery of Europe, 1720-1830 (Stanford, CA: Stanford University Press, 1969), pp. 31-58. 37 By “modernity” I mean the global sociopolitical transformation associated with Western-oriented capitalism, colonialism, industrialism and nationalism in the nineteenth and twentieth centuries. 38 See Louise Young, Japan’s Total Empire: Manchuria and the Culture of Wartime Imperialism (Berkeley: University of California Press, 1998); Yoshihisa Tak Matsusaka, The Making of Japanese Manchuria, 1904-1932 (Cambridge: Harvard University Asia Center, 2001). 39 Hai Zhao, Manchurian Atlas: Competitive Geopolitics, Planned Industrialization and the Rise of Heavy Industrial State in Northeast China, 1918-1954 (PhD dissertation, University of Chicago, 2015). 40 See Mun Young Cho, The Specter of “the People”: Urban Poverty in Northeast China (Ithaca, NY: Cornell University Press, 2013). 41 Yi Baozhong, chaoxian yimin yu dongbei shuitian kaifa (朝鲜移民与东北地区水田开发) (Changchun: Chuangchun Press, 1999). 42 Hunchun shi difangzhi bianzhuan weiyuanhui, Hunchun Shi Zhi (珲春市志), (Chuangchun: Jilin renmin chubanshe, 2000), pp.11-18. 45 Ge Xiufeng, “Hunchun zaoqi duiwai maoyi(珲春早期对外贸易),” in Wenshi ziliao weiyuanhui, Yanbian Committee of the CCPCC, ed., Xiri Yanbian Jingji,Yanbian Wenshi Ziliao, Vol. 7 (昔日延边经济：延边文史资料第七集), (Yanji: Yanbian Renmin Press, 1995), p. 212. Also see Tōkanfu Rinji Kantō Hashutsujo Zanmu Seirijo,Kantō sangyō chōsasho (間島産業調査書), Shōgyō, pp. 23-26, pp. 112-114. 46 Chōsengun Shireibu. Kantō oyobi Konshun (間島及琿春), 1921, pp.55-56. 47 Japan did this by lowering the import tax for Japanese goods. See Hunchun shi zhi, p.400 and p.461. See also Setsurei Tsurushima, Tomankō chiiki kaihatsu (豆満江地域開発), (Suita-shi : Kansai Daigaku Shuppanbu, 2000), p.176. 48 Hunchun shi zhi, pp.455-461. 49 Greater Tumen Initiative (accessed on May 6, 2015). 50 See the interview with Deng Kai, CCP secretary of the Yanbian Korean Autonomous Prefecture, in 2007 by the Xinhua News Agency. 51 For example, see Shen Yue, “Tumenjiang quyu guoji hezuo: libi yinsu yu jianyi (图们江区域国际合作:利弊因素与建议),” Jingying guanli zhe, 2013, Issue 27. 53 Central People’s Government of People’s Republic of China, official website (accessed on May 6, 2015). 54 Takeshi Hamashita, “The Future of Northeast Asia,” in Stephen Kotkin and David Wolff, eds., Rediscovering Russia in Asia: Siberia and the Russian Far East(New York: M. E. Sharpe, 1995), p. 320.